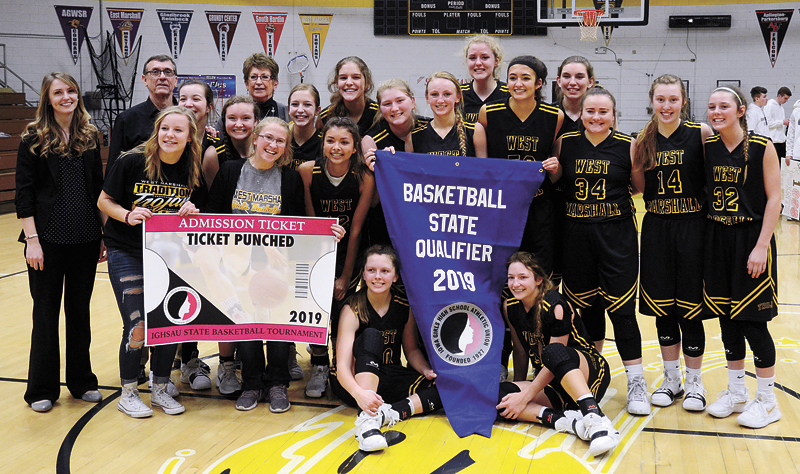 T-R PHOTO BY ROSS THEDE - The West Marshall girls basketball team rallies around its Class 3A state qualifier banner after beating No. 8 Iowa Falls-Alden 43-37 in the Region 6 finals Saturday night in Conrad. CONRAD — Three hundred and sixty-four days earlier, for the second year in a row, the West Marshall girls’ basketball team tasted bitter defeat in the Class 3A regional finals. The Trojans finally found the charm the third time through. 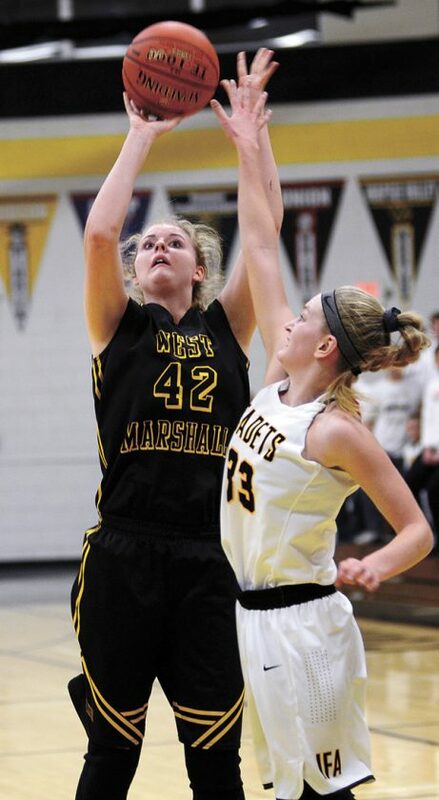 West Marshall overtook eighth-ranked Iowa Falls-Alden with a 13-5 third-quarter advantage and never looked back, beating the Cadets 43-37 in the Region 6 championship game on Saturday night behind a complete team performance on both ends of the court. 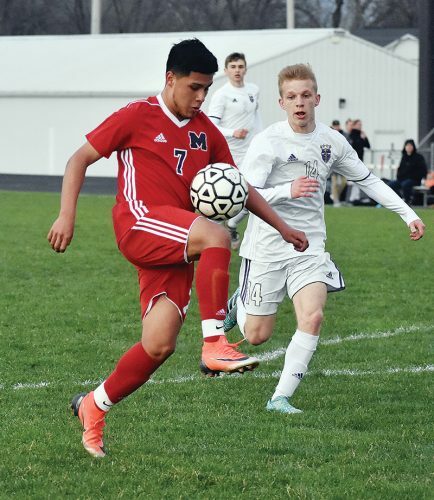 Having come up one win short of the state tournament each of the last two seasons — by a combined five points — the Trojans (14-7) found their motivation in the memories of how miserable those regional final losses felt. None were more motivated than Teresa Disney. T-R PHOTO BY ROSS THEDE - The West Marshall girls basketball team poses with its Class 3A state qualifier banners after winning Saturday’s Region 6 final over No. 8 Iowa Falls-Alden, 43-37. West Marshall’s junior post fought back the emotion for as long as she could before unleashing it in a river of tears after the final horn sounded the state tournament berth she wanted to honor a loved one with nearly one year ago to the day. On Feb. 17, 2018, Disney’s grandfather passed away and then she sprained her ankle and only got to play two minutes in the Trojans’ regional final loss to South Tama County. 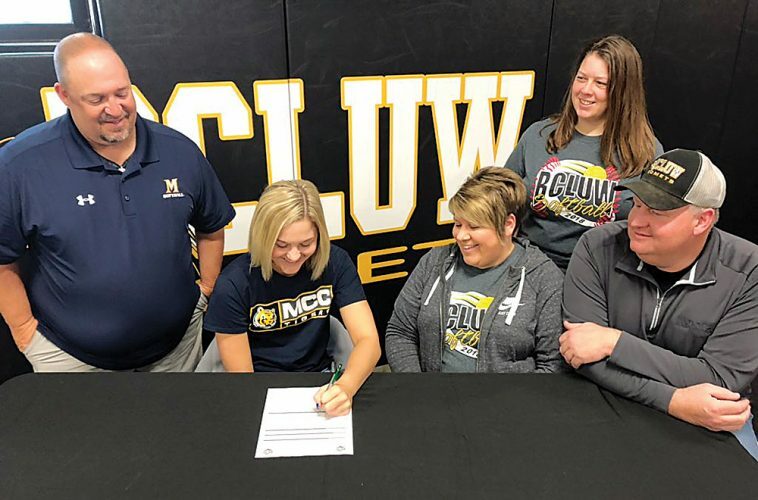 She’d been waiting 364 days for another shot at getting to state, and when West Marshall head coach Fred Zeller called her number, Disney didn’t disappoint. The Trojans’ second-half surge was driven by the team’s post dominance, and Iowa Falls-Alden’s 3-point blitzkrieg was off target. So Disney’s nine points, Renae Schaper’s team-leading 12 points and two Grace Girard buckets powered West Marshall into the state tournament for the 10th time in program history and the first time since 2012. Instead, West Marshall salted the game away at the free-throw line — sort of — as Iowa Falls-Alden (19-3) came up empty in its comeback attempt. Having trailed by as many as seven points in the first half, the Trojans outscored the Cadets 13-5 in the third quarter to capture a 25-22 lead they never relinquished the rest of the way. “I think our kids deserved a little good luck instead of bad luck,” said Zeller, who will coach his fifth Trojan contingent at state. “We’ve had chances the last two years, and we were very deserving both those years, and tonight we came out and played like we have to play against a good team like Iowa Falls-Alden. Kayla Cripps also scored nine points for the Trojans, including back-to-back layups playing off post passes, and Schaper’s and-one basket put West Marshall on top with 1:14 left in the third quarter. Karlyn Snider made 2-of-3 free throws with 3.5 seconds left and the Trojans led 25-22 heading into the fourth. Another Trojan push put seven straight points on the board — four for Disney and three for Cripps — and West Marshall’s eight-point lead was enough cushion to help them overcome another bumpy night at the free-throw line. A 53.4 percent free-throw shooting team, the Trojans went 10-for-18 at the stripe in the fourth quarter, including 7-for-12 inside the final minute, to seal the victory. Defending Iowa Falls-Alden demanded it, too. The Cadets entered the game as the fifth-leading 3-point shooting team in all of 3A, and in the end it was the death of their postseason run, too. Iowa Falls-Alden fell in love with the long-range shot and abandoned its drives to the basket, opening the door for West Marshall’s second-half comeback. IFA finished with eight 3-pointers and just four 2-pointers — and a season-low 37 points — against West Marshall’s sixth-ranked defense. The Cadets, who defeated West Marshall in the second game of the season, 60-51 in Iowa Falls, simply struggled to shoot the ball. “We knew it was going to be a battle,” said IFA head coach Brandon Uhlenberg. “We really wanted to get up and down and be a fast-paced game but we weren’t able to establish that. Katie Meyer scored a game-high 20 points for the Cadets, who were shooting for their first state tournament appearance since 1996. Instead, West Marshall returns to Wells Fargo Arena for a state quarterfinal clash with Center Point-Urbana (21-2) at 10 a.m. on Feb. 26. 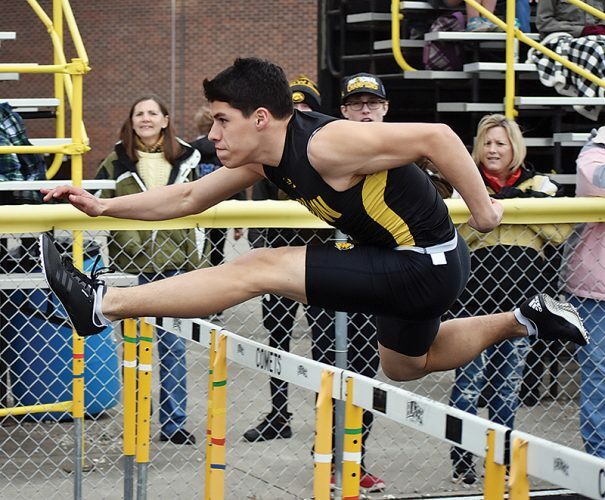 The Stormin’ Pointers — ranked third by the Iowa Girls High School Athletic Union — are seeded second and the Trojans are seeded seventh. “It was a very emotional game for our kids and the coach,” said Zeller, choking up. “When you’ve coached as long as I have, sometimes you think this is your last shot at it and who knows? Maybe it is, maybe it isn’t, but I thought once the game got started any doubts we had that we could play with them were erased. 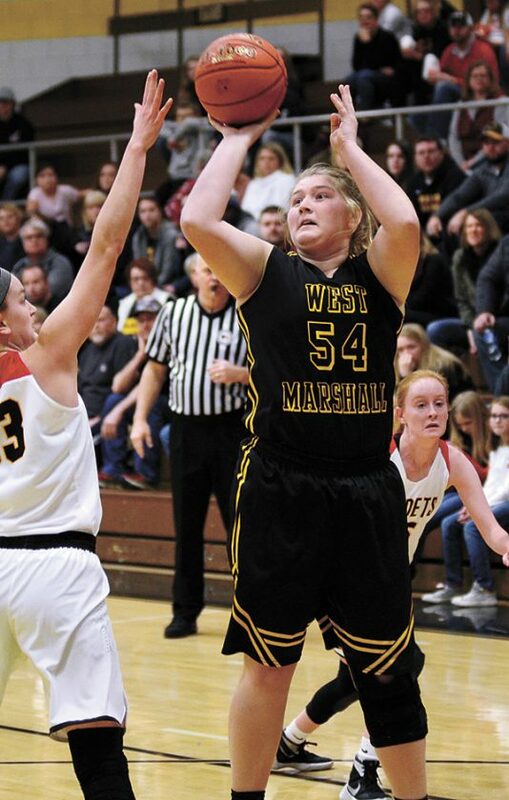 WEST MARSHALL (14-7) — Avril Sinning 0 4-6 4, Kayla Cripps 4 1-3 9, Karlyn Snider 0 5-9 5, Teresa Disney 4 1-3 9, Grace Girard 2 0-0 4, Renae Schaper 4 4-5 12. TOTALS 14 15-26 43. IOWA FALLS-ALDEN (19-3) — Madalyn Juhl 0 0-0 0, Grace Juhl 0 0-0 0, Grace Renaud 1 3-4 6, Katie Meyer 7 2-3 20, Darby Dodd 2 0-2 6, Ellie Meyer 1 0-0 3, Jenny Wibholm 1 0-0 2. TOTALS 12 5-9 37. 3-Point Goals–IFA 8 (K. Meyer 4, Dodd 2, E. Meyer, Renaud). Total Fouls–WM 12, IFA 22. Fouled Out–M. Juhl. AP PHOTO – Kansas State guard Barry Brown Jr. (5) is fouled by Iowa State forward Cameron Lard (2) during the second half of a Big 12 Conference basketball game in Manhattan, Kan., Saturday. AP PHOTO – Iowa guard Joe Wieskamp (10) celebrates with teammates after Iowa defeated Rutgers 71-69 in a Big Ten Conference basketball game Saturday in Piscataway, N.J.
T-R PHOTO BY ROSS THEDE – Marshalltown senior Alyvia Chadderdon, right, fights for possession of the basketball during the team’s 66-30 loss to third-ranked Southeast Polk on Saturday in Pleasant Hill. T-R PHOTO BY ROSS THEDE – Marshalltown junior Madi Finch (14) knocks down a jumpshot over Southeast Polk’s Sami Albertson during the second half of Saturday’s Class 5A Region 2 semifinal game in Pleasant Hill. Finch scored 14 points to lead the Bobcats. T-R PHOTO BY THORN COMPTON – South Tama County sophomore Tylese Rosenberger (12) goes for a shot while North Polk defender Katie Brown contests during the first quarter of the Trojans’ 72-34 loss to the Comets on Saturday in Pleasantville. T-R PHOTO BY THORN COMPTON – South Tama County seniors Jaelin Berger, front, Zoee Buffalo, right, and Taylor Ray are overcome with emotion as the Trojans fall to North Polk in the Class 3A Region 7 finals in Pleasantville on Saturday, 72-34. T-R PHOTO BY ROSS THEDE – The West Marshall girls basketball team rallies around its Class 3A state qualifier banner after beating No. 8 Iowa Falls-Alden 43-37 in the Region 6 finals Saturday night in Conrad. T-R PHOTO BY ROSS THEDE – The West Marshall girls basketball team poses with its Class 3A state qualifier banners after winning Saturday’s Region 6 final over No. 8 Iowa Falls-Alden, 43-37. T-R PHOTO BY THORN COMPTON – East Marshall/GMG senior Noah Bandstra, left, works his way into a takedown on Mid-Prairie’s Isaac Boucher during the first period of their Class 2A 195-pound fifth-place match on Friday at the Iowa High School State Wrestling Tournament in Wells Fargo Arena. Bandstra would pin Boucher in 1 minute, 13 seconds, to secure the fifth-place medal.